Having arrived in England just two months earlier, Sergeant Bruce Baker, Jr. was assigned to the crew of 1st Lieutenant John Alford of the B-17 Bomber 42-31898, nicknamed “Irene A. His crew position was that of a Ball Turret Gunner, perhaps the most undesirable crew position on the aircraft according to the Army Air Corps Museum. The ball turret was located on the underside of the aircraft, not very far from the ground. Generally, the ball gunner was one of the shortest or smallest men on the crew because of the cramped quarters and the gunner sat in a fetal-like position. Very few gunners had room for a parachute inside the ball turret, so the gunner wore a safety strap for protection against falling out of the aircraft, should something happen to the turret in flight. The turret offered almost no protection against flak, it was an easy target for enemy aircraft, and it was the most difficult position to escape from in case of an emergency that required bailing out. Because the turret sat under the aircraft not far from the ground, a trapped gunner also had to worry about the landing. If a plane's landing gear couldn't be lowered, the results could be disastrous for the trapped gunner. At 5’ 8” and 149 pounds Bruce Baker was the ideal candidate. In the short time he had been flying out of Thurleigh, England with the 326th Bomber Squadron, 92 Bomber Group, he had already been awarded two Air Medals and flown 15 combat missions over enemy territory. Today’s mission, Saturday July 15th, was probably looked at as a “milk run” as it was an afternoon practice mission that would not involve being shot at. According to the book, “The Route As Briefed” this mission turned out deadly for three members of the crew. Upon attempting to land after the mission the wheels bounced on the runway and the aircraft was airborne again, with one wing bursting into flames. Lt. Alford climbed to about 900 feet, levelled off and ordered the crew to bail out. The plane crashed and burned about six miles south of the base. 2nd Lt. Stanley Nadel, the navigator, and T/Sgt Paul R. Horton were killed. 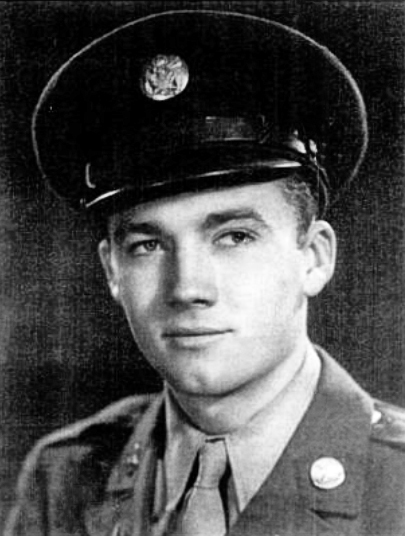 Sergeant Bruce C. Baker, Jr., the ball turret gunner, parachuted out but his chute streamed down and failed to canopy, and he was killed immediately upon impact with the ground. Lt Alford and his co-pilot, 2nd Lt Robert E. Williams parachuted safely without injury and T/Sgt Thomas J. Madden, the engineer, parachuted safely with only slight skin lacerations." Parents Bruce Baker, Sr. and Jewell Edna Rhodes-Baker received the news of their son’s death by telegram on Sunday, July 23rd. “The Secretary of War asks that I assure you of his deep sympathy in the loss of your son, Sergeant Bruce C. Baker, Jr. Report received states he died fifteen July in England as result of injuries incurred in aircraft accident. Letter follows.” Survivors at the time were his parents, brother William Earl, grandmothers, Mrs. Sallie Baker and Mrs. Sam Rhodes. Interred in England his remains returned home for reburial in the New Prospect Cemetery, Timpson, Texas on July 15th, 1948 exactly four years after his death. Burial was with full military honors provided by the Timpson American Legion Post. Sources: Ancestry.com; Family Search.org; Shelby County Texas History.net; Find A Grave Memorial 68034745; History of the 92 Bomb.org; Timpson Weekly Times, 7/28/1944; National Archives.gov and David Pike).